“I have been challenged several times at this CSW on why are we here? What are we doing to create or generate change? These are exactly the questions I asked when I first started attending CSW many years ago. Thousands of women and a few men from civil societies around the world arrive in New York with great expectations, some for a week, some for a few days, some for the whole two weeks of discussions. At huge expense, often paying for themselves. It all becomes very confusing and overwhelming for many. For some it provides an opportunity: opportunity to share, to celebrate, to collaborate, to network, to develop, to inform. However, one of our young delegates pointed out that on the whole we are sitting in rooms talking and listening to like minded people. Are we? And yes, to some extent all of those observations are true. From early on my interest became focussed into the second week of the meeting, especially as I began to recognise the influence which non-governmental organisations such as Soroptimist International (SI) can have in persuading Member States to improve their agreement at the end of the meeting. The Agreed Conclusions give everyone an opportunity to express how women and girls can be defended, supported and recognised as equal members of all societies. This means concentrating on a complex text on which Member States negotiate in the final stages during CSW. This document is hopefully signed up to by all UN Member States represented by the 45 members of the Commission sitting in Committee. Once this document is agreed, NGOs and civil society have a benchmark which they can use in their home countries to advocate for policy and legislative change. This all starts many weeks before CSW meets in New York. In the UK and in other countries Government officials start discussions with non-governmental organisations about the issues they have concerns over in relation to the main theme of CSW that year. The UN Secretary General produces a report reviewing the position globally, usually in the December prior to CSW. By February a document known as the Zero Draft is published as a framework to start discussions in Member States and UN Regions. We are involved with Governments as soon as the UN Secretariat issue the Zero Draft of Agreed Conclusions. SI issues recommendations via the Federations which Soroptimists can then present to their Governments. Of course this is not always possible because there are some Governments which will not connect with or reach out to Civil Society and Non-Governmental Organisations but there are enough who are willing to listen. One of the actions which Soroptimists can take in their countries is to work in partnership with other like-minded NGOs well in advance of the annual CSW meeting so that they can try collectively to have dialogue with the Ministers responsible for gender equality in their countries. This makes it so much easier to firstly get recognition of the Soroptimist ‘asks’ at an early stage in the negotiations, then to engage with that country and its delegation. Several Soroptimists are now or have been NGO members of their country delegations: Iceland, Denmark, Germany, Belgium, Austria for example. There are several stages to the negotiations, and at each stage a different version of the text for the Agreed Conclusions is issued to Member States. Sometimes it is difficult for NGOs to see a copy, but the NGO/CSW New York Committee is often instrumental in circulating these. Once CSW commences the negotiations begin in earnest. All Member States are endeavouring to promote the language they want to see included. In most cases reliance is on language that has previously been agreed at the UN, not always at CSW. SI tries to move things forward for women and girls. One example of this is the change in approach to Female Genital Mutilation (FGM) from ‘acceptable traditional cultural practice’ to inclusion in Agreed Conclusions of the specific mention of FGM as an unacceptable practice of violence against girls, to Member states legislating to make this practice illegal on a number of grounds, including health and violence against girls. Progress through CSW, although it may take a few years. Each year there continue to be major issues of difference even if language was previously agreed. 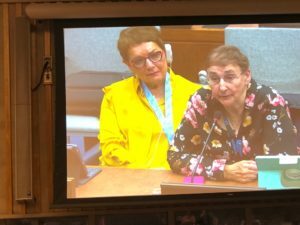 One of the most contentious is around Sexual and Reproductive Health Rights and it would seem that this continues to be problematic for CSW63 even though acceptable language has been agreed in previous years. This year one of the challenging issues relates to migration. 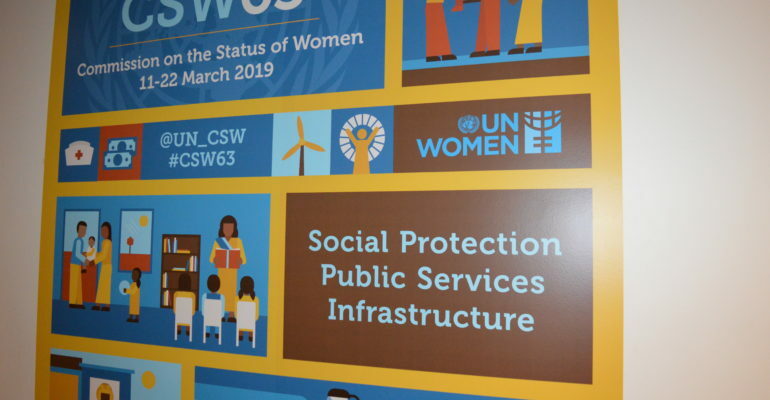 The main theme for CSW63 is around social protection and public services for women. Should migrant girls be included? What is acceptable wording to those countries taking in many migrants, bearing in mind the impact on their public finances? As I write, this has not yet been settled so come back to see the post CSW63 blog when and if we have Agreed Conclusions! The process and discussions around reaching Agreed Conclusions is complex and there is so much more I could write. Don’t hesitate to contact me at SI if you wish to find out more”. Great explanation, Pat. I hope members read it and recognise the contribution their work on the ground has to this process and our voice at CSW. Yes I agree. Great explanation. Thanks. Excellent Pat. I do hope that many will read this.